If seeing all those disposable coffee cups spilling out of your office trashcan gives you heartache, then give them a new home in the Naturwall. 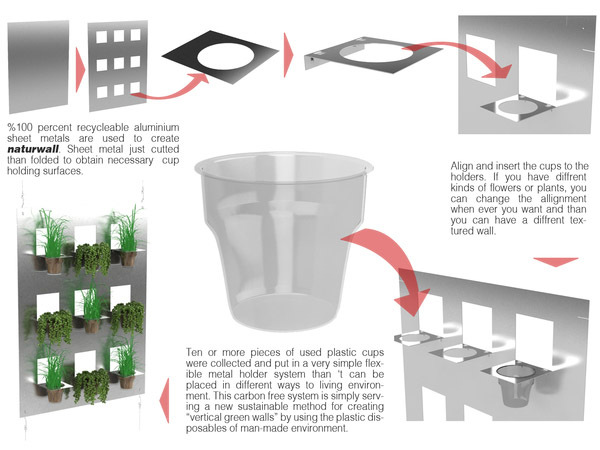 This cool living wall system reuses disposable coffee and tea cups as plant pots to create a lush green wall. Each system features a very simple, flexible metal rack that can hold between 10-12 cups. The carbon-free design aims to reduce plastic waste while serving as a do-it-yourself decoration. Designed by Dr.Hakan Gürsu and Designnobis, the Naturwall was also honored with the Green Dot 2008 Build Award.